Immediate possession available on this outstanding 1456 sq. ft. home in the scenic South Thompson valley, just 15 or so minutes east of Kamloops, located on a generous lot in a nice quiet park with affordable pad rent. This home has seen many recent renovations including a 1 yr old roof, new front and rear porch, all new paint and vinyl plank flooring thru-out, counters, plumbing fixtures and more. 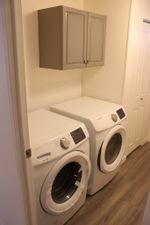 5 brand new appliances are included, there are 3 bedrooms and 2 baths, a great view of the South Thompson river and valley, a generous yard, a big 25 x 14 deck, and a bonus 25 x 10 wired workshop under the deck. This is an excellent starter or downsizer home. The park allows pets but no rentals. Great value here, don't miss out. Quick possession is available, contact Ken McClelland at Remax Kamloops for your exclusive viewing opportunity.